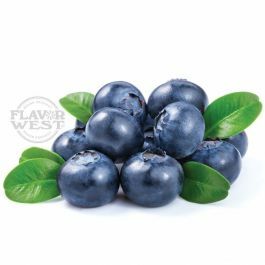 The blueberry flavor offers a distinct aroma and sweet taste values. Enjoy the sweet taste quenching fruity flavor in your favorite cake, yogurt, oatmeal, smoothies and more. Type: Blueberry Water Soluble Flavoring . Ingredients: Natural and Artificial Flavoring, Propylene Glycol and Ethanol. USP Kosher Grade Flavoring. Usage Rate: 15-20% for E-use. Flavor suitability: Desserts, pastries, yogurt, ice cream, drinks and beverages, candies and more. Specific Gravity: 1.03 No Refunds on Flavoring. You can't really go wrong with this as a blueberry. It tastes just like a handful of real blueberries, minus any sugars. Add sweetener at 2-3 drops per 10mls for a good, straight mix. It's a very natural tasting Blueberry by itself, perfect for E-use. Mixes very well with Desserts, Mints, Menthol, and other Fruits. Makes an outstanding delish Blueberry Doughnut. If you LOVE Blueberry, you'll LOVE this Flavoring! Get some!! !